While in developed countries there has been a rapid increase in grid connected PV systems, in developing countries the majority of PV systems are stand-alone off-grid systems. 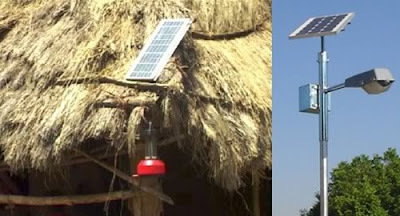 The off-grid systems can be used to drive a load directly; water pumping is a good example – water is pumped during the hours of sunlight and stored for use; or a battery can be used to store power for use for lighting during the evening. If a battery charging system is used then electronic control apparatus will be needed to monitor the system. All the components other than the PV module are referred to as the balance-of-system (BOS) components. The figure below shows a typical configurations for an off-grid PV system. Such systems can often be bought as kits and installed by semi-skilled labor. For correct sizing of PV systems, the user needs to estimate the demand on the system, as well as acquiring information about the solar insolation in the area (approximations can be made if no data is readily available). It is normally assumed that for each Wp of rated power the module should provide 0.85watt hours of energy for each kWhm-2 per day of insolation (Hulscher 1994). 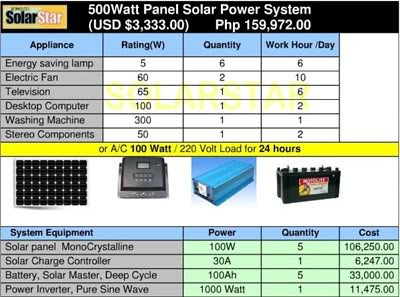 Therefore if we consider a module rated at 200 Wp and the insolation for our site is 5 kWhm-2 per day (typical value for tropical regions), then our system will produce 850Wh per day (that is 200 x 0.85 x 5 = 850). No fuel requirements – In remote areas diesel or kerosene fuel supplies are erratic and often very expensive. The recurrent costs of operating and maintaining PV systems are small. Modular design – A solar array comprises individual PV modules, which can be connected to meet a particular demand. Reliability of PV modules – This has been shown to be significantly higher than that of diesel generators. Easy to maintain – Operation and routine maintenance requirements are simple. Long life – With no moving parts and all delicate surfaces protected, modules can be expected to provide power for 15 years or more. National economic benefits – Reliance on imported fuels such as coal and oil is reduced. Environmentally benign – There is no pollution through the use of a PV system – nor is there any heat or noise generated which could cause local discomfort. PV systems bring great improvements in the domestic environment when they replace other forms of lighting – kerosene lamps, for example. Local assembly of PV modules and BOS components While generally it is only the larger developing countries which have capacity to manufacture solar cells, it is increasingly common for assembly of the module and the balance of system (BOS) components in many developing countries. This not only reduces the over all cost of syste, but creates local employment and ensures that the systems are designed for local applications. Solar PV systems can be used in conjunction with other energy technologies to provide an integrated, flexible system for remote power generation. These systems are referred to as hybrid systems. Common configurations of hybrid systems could include a solar PV array, wind generator and diesel generator set which would allow generation in all weather conditions. Such systems need careful planning. A new innovation is the solar lantern. Originally designed for the outdoor leisure market in western countries, this simple lantern with a small PV module (5 – 10 watts) is extremely appropriate to use in rural areas of developing countries for replacing kerosene lamps. the size and the cost of the solar system is much reduced for each household. Solar PV can be used for providing power for small grid systems, with centralised power generation. As the cost of PV cell production drops, their use for medium scale electricity production is being adopted more widely. There is also scope for large-scale electricity production for such applications as peak power provision. Using the total cost above, if you are paying P3,000/month for electricity, the break-even period is 5 years. And since a typical solar panel lasts 15-20 years, you will be using clean and free electricity for the next 10-15 years.